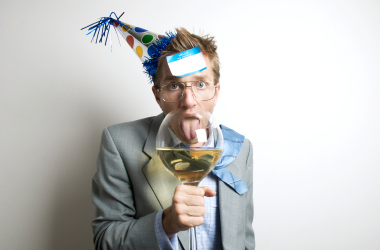 Office Christmas parties can be quite the sad, dull affair. Bad music that is either danced to ironically or keeps people statuesque so as to avoid being outed as the closeted Michael Buble fan they secretly are. Bottom shelf booze that is necessary to get through the boss’s awkward attempts at humor that feel more like barely veiled harassment, but said booze should be taken in moderation lest you wind up in the copy room with Geoff from finance with the lazy eye and long fingernails. Basically, uncomfortable, gross, though potentially resulting in a massive out-of-court settlement. Not worth it though. Why not bring your team to Amsterdam’s coolest boat tour company for a cruise around this magnificent jigsaw puzzle of a city we call home, made even more beautiful by the Amsterdam Light Festival going on through 21 January. Don’t worry, we know that the idea of you and nine colleagues in tight quarters for 90 minutes could be awkward…..especially if you’re in IT, so our guides are well equipped to keep the conversation moving, entertaining you with personal stories of the city intertwined with history as well as the more fun, risqué elements. We guarantee you’ll have a grand time, even if you hate your colleagues. Our standard boats seat 10-12, but we have access to bigger boats upon request if you have more colleagues you can’t stand! We’ll provide a glass of glüwein, but you’re welcome to arrange whatever you’d like to eat, drink, and if you work in that kind of office, we even allow smoking assuming that’s the kind of thing that……..floats your boat. That’s right, for absolutely zero extra charge, we’ll be dropping boat puns port and starboard. For an extra payment, we’ll stop. Those Dam Boat Guys are a green-thinking company that has reimagined synergetic corporate team building so as to ensure you get the best ROI possible. Their streamlined, cloud-based booking system is paradigm shifting in its complex simplicity, allowing you to refocus your energies on maintaining your quarterly growth. Our locally sourced, but very international team will cruise you around in sustainable, farm to table electric boats to help us to minimize our carbon footprint, so you can enjoy your team cohesion without going against your corporate values. Despite our organization having many moving parts, our core competency is off the charts and is sure to move the needle, surely empowering your team to make hay in the coming fiscal year. Buzz word buzz word ENGAGEMENT! For more info or to book, email us at ahoy@thosedamboatguys.com or via our contact page.